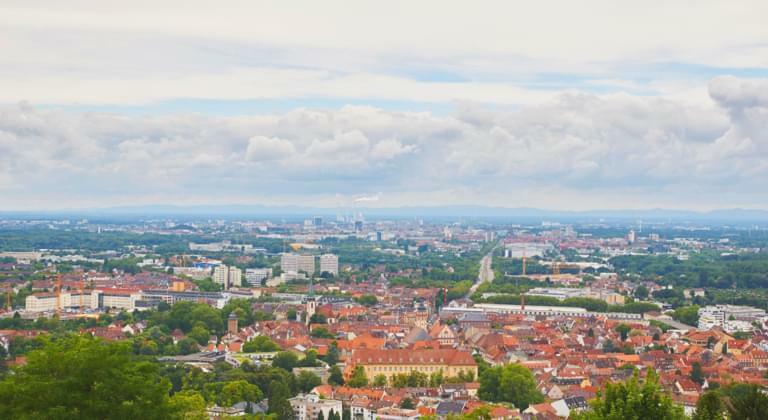 With more than 300,000 inhabitants is Karlsruhe the second largest city in the state of Baden-Württemberg. The largest is Stuttgart, which is the state capital of Baden-Württemberg with more than 600.000 inhabitants. The cheerful university city of Karlsruhe is bounded to the west by the Rhine, which is also the border between Baden-Württemberg and Rhineland-Palatinate. We collaborate with all major car hire companies in Karlsruhe. Therefor you can book a cheap rental car in the city. Karlsruhe is located just under 300 kilometres northwest of Munich and about 140 kilometres south of Frankfurt am Main. Visitors to the city can explore the sights and attractions by rental car. The state of Baden-Württemberg and the state capital Stuttgart arose from the merger of Baden, Württemberg-Baden and Württemberg-Hohenzollern. From the foundation of Karlsruhe to the merger of the federal states into the federal state of Baden-Württemberg, Karlsruhe was the capital city and thus the cultural and political centre of Baden. This is still reflected today in the numerous historical buildings. The significance of Karlsruhe as the seat of the Supreme Court of the Federal Republic of Germany also has its historical origins here. Karlsruhe has an excellent infrastructure and excellent transport connections. The city is easily accessible by public transport, with your own car and with a rental car. Karlsruhe is a university city and offers a wide range of cultural and sporting activities. The shopping offer is also broadly diversified: large shopping malls that cover daily needs, shops where you can buy cheaply, as well as shopping facilities for upscale demands and luxury goods. Karlsruhe is one of the planned cities in Germany and represents the largest city in Baden-Württemberg that was planned on the drawing board. Planstadt means that the city has not "grown", i. e. it has developed over the centuries from a small village, but has actually been planned in its layout and built on a greenfield site, so to speak. The planning for Karlsruhe was based on the Margrave of Baden, Karl Wilhelm von Baden-Durlach. He had a residence built, the centre of which was the magnificent castle. All streets started from the castle in a fan shape, which earned Karlsruhe the name "Fan City". There were several settlements in the vicinity of the town, the region was inhabited already in the early times. Some of the settlements are still preserved today and represent districts of Karlsruhe, such as Durlach. The individual, partly historical districts of the city are also worth seeing, so that an exploration with the rented car is absolutely possible. Especially Durlach has a lot to offer in this respect. The district is considerably older than the city of Karlsruhe itself and captivates with its charming medieval old town. Of course, you can get to know the city during a day trip. But that's only enough for a superficial impression. If you want to get to know the charming former residence city better, you should plan several days for the visit and explore the attractions of the city and its surroundings by rental car. The gastronomic offerings are also broadly diversified. From the noble restaurant to the cosy restaurant, where you can dine well and cheaply, everything is represented. If you are going on a city trip, you want to visit unique sights. The city's attractions include the magnificent Karlsruhe Castle, the Botanical Gardens, the Catholic Church of St. Stephen, the oldest church in Karlsruhe, and the Protestant City Church. This was built as a cathedral church in Baden and impresses not only with the high columns of its façade. The Zoological City Garden is also worth a visit, as are the Majolika Manufaktur and the "Ständehaus Memorial". The charming pheasant castle, the Turmberg in Durlach and the Prinz-Max-Palais also invite you to visit. Karlsruhe's cityscape is dominated by more than 200 fountains, some of which are extremely representative. If you don't want to use your own car, you can travel to Karlsruhe by bus, train or plane. This is a good idea if you use the car rental price comparison from Driveboo to find cheap deals. Karlsruhe is only about 40 kilometres away from Karlsruhe/Baden-Baden (FKB), the second largest airport in Baden-Württemberg. The largest airport in Baden-Württemberg is Stuttgart Airport (STR). It is about 100 kilometres from Karlsruhe away. If you don't want to miss your car during your stay in Karlsruhe, even if you arrive by bus, train or plane, you are welcome to rent a car. In Karlsruhe as well as in other cities of the state of Baden-Württemberg there are numerous offers of car rental companies. Simply enter the desired pick-up point in the search form when searching for a rental car and pick up your car at the desired time. No matter whether you want to receive your rental car directly at Karlsruhe airport or at a station in the city, at driveboo.com you book not only with price transparency but also with TÜV certified security. The magnificent building was constructed between 1715 and 1718. At that time, it received its Baroque appearance, reminiscent of the magnificent buildings of that period, such as the Munich residence. The original freestanding tower of the palace was connected to the central building of the extension buildings at Karlsruhe Castle. The characteristic dome of the castle tower dates back to this period of reconstruction. From the tower there is a magnificent view of the city, the fan-shaped layout of the 32 radial streets and the unique balance of the city's layout can be seen from here. The castle is open to the public and houses the Badisches Landesmuseum. It is one of the most attractive cultural-historical museums in Germany. The visit is more than cheap at certain times, Happy Hours allow free admission. The interior of the castle was not historically reconstructed after its destruction during the Second World War, unlike the exterior façade of the magnificent building. Inside the castle, the structure was designed to meet the requirements of a modern museum. It is a good idea to visit Karlsruhe Castle by rental car, as there are several multi-storey car parks close by where you can park your car conveniently and inexpensively. A visit to Karlsruhe includes a visit to the magnificent squares and grounds. You can usually be reached very easily by rental car, there are numerous possibilities to park your car close to these touristic attractions. One of the most beautiful squares in the city is the market square with the pyramid built in 1823, which was erected above the tomb of the demolished Konkordienkirche church. The crypt is the last resting place of the town founder. If you park your rental car conveniently near the market square, you can also visit the town church, the market fountain and the town hall. The lushly landscaped Friedrichsplatz with its picturesque fountains invites you to a relaxing break between shopping and sightseeing. On Kaiserplatz, an impressive equestrian statue commemorates Kaiser Wilhelm I. One of the most popular squares in the city centre is Ludwigsplatz, which boasts bars, cafés and well-kept restaurants. Gutenbergplatz also offers opportunities for refreshment and shopping. In addition, one of the largest weekly markets in Karlsruhe is regularly held here, where visitors can buy regional specialities at favourable prices. The offers range from homemade spaetzle to the high-percentage fruit schnapps and Black Forest ham. The Lindellplatz is a familiar and idyllic setting, while the Werderplatz forms the cultural centre of city district "Südstadt". Both the Federal Constitutional Court as well as the Federal Supreme Court are located in Karlsruhe. The Federal Supreme Court is housed in the former hereditary grand duchy palace, a palatial and magnificent building. It is the supreme court of the Federal Republic of Germany in relation to the ordinary jurisdiction. The Federal Constitutional Court has been located in a specially constructed building near the castle since 1969. The Attorney General's Office is also located in Karlsruhe. The "Platz der Grundrechte", which was created in 2005 and is located between the Schlossplatz and the Zirkel, is remarkable. Here the visitor will find 24 double-sided road signs on the subject of law and the law. Statements by lawyers, judges and citizens who have had difficulties in one way or another with the implementation of legal issues are interesting and enjoyable. The rental car makes the city visitor flexible and independent. Not only Karlsruhe can be visited, but also other interesting cities and attractions of the state of Baden-Württemberg. There is also no shortage of excursion destinations in this region. For those interested in the history of the automobile, a trip on the historic route between Pforzheim and Mannheim is an ideal option. In 1888, Bertha Benz wrote automotive history. Together with her two sons, she and her husband Carl Benz drove this route in a car designed and built by her husband Carl Benz to prove the suitability of the invention. She has succeeded impressively. The Bertha Benz Memorial Route follows the route of the world's first long-distance journey and can be followed by a rental car. The rental car is also ideal for excursions to Stuttgart or the picturesque Black Forest with its numerous sightseeings. Karlsruhe is only about 40 kilometres from the spa town of Baden-Baden with its famous casino. This route can also be covered comfortably and cheaply by rental car. We have a large number of different rental cars for private as well as professional purposes - so you have the right car for every occasion. We work with all major car rental companies together. With us you find great prices at local car hire partner companies. With the price comparison of Driveboo you can book your car rental at favourable conditions and save up to 60 percent. If you should unexpectedly get in the way of renting a car, this is no problem! Simply use the free cancellation until 24 hours before the beginning of the rental period. In addition, you also benefit from TÜV-approved safety, so you can be absolutely sure that you will not take any risks with us.